From Culture Fly. 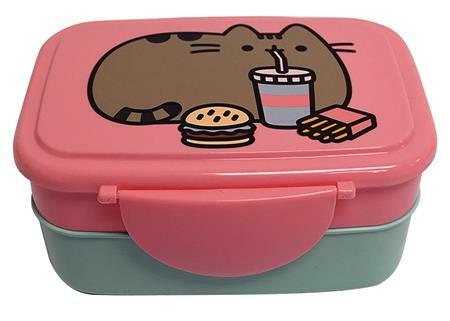 This cute mint and pink bento box features Pusheen enjoying yummy fast food! Double layered lunchbox with snap lid clip-lock and elastic band. Top layer features two compartments, each measuring approximately 4.5 x 3.5 x 1 inches. Second layer features one compartment measuring approximately 7 x 4.5 x 1.75 inches. Measures approximately 7.2 x 5.4 x 3.5 inches when stacked and closed. Suitable for microwave, dishwasher, and freezer.